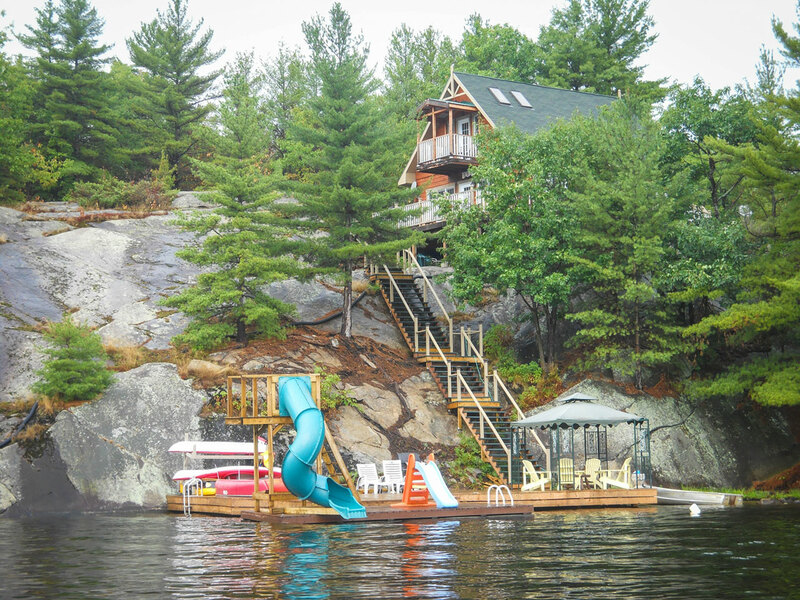 A family of cottages in beautiful Muskoka that embody the heart and soul of cottage country and are the perfect escape from the city. 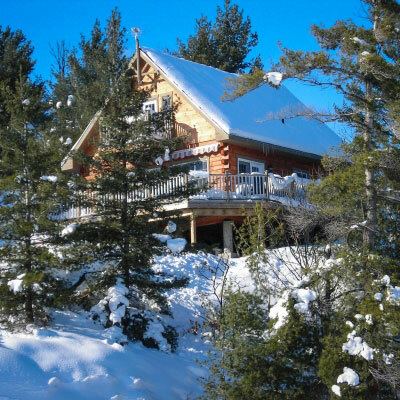 Explore the natural beauty of “Rocky Pines”, featuring a three bedroom main cottage, four-piece bathroom, fully equipped kitchen, modern entertainment amenities and a separate bunkhouse, ideal for older kids. 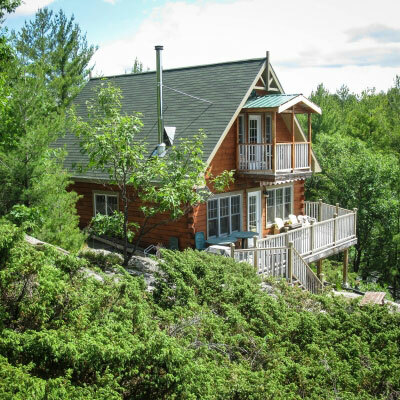 A sandy and gradual depth beach with a shoreline of 570 feet, the property is situated on a four acre lot, surrounded by crown land for complete privacy. 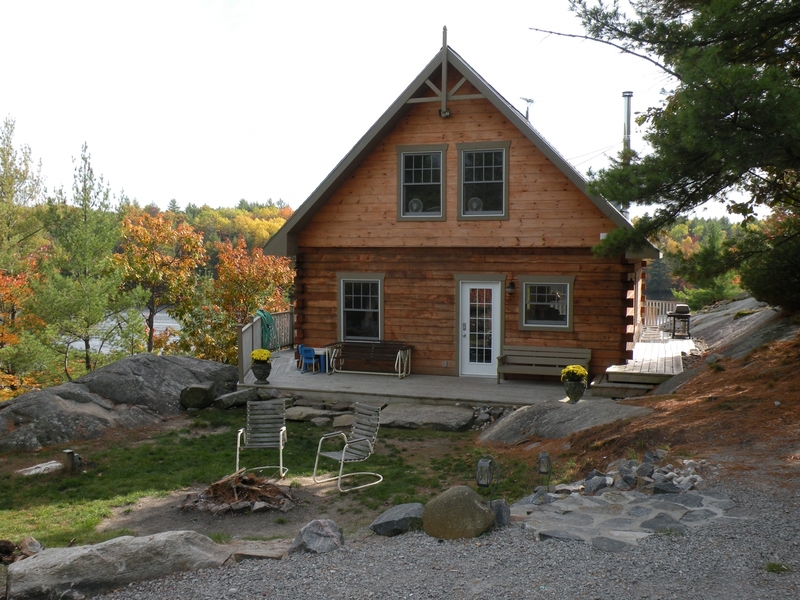 With a travel time of just under two hours from Toronto, the solidly constructed log cottage is winterized for year round enjoyment. 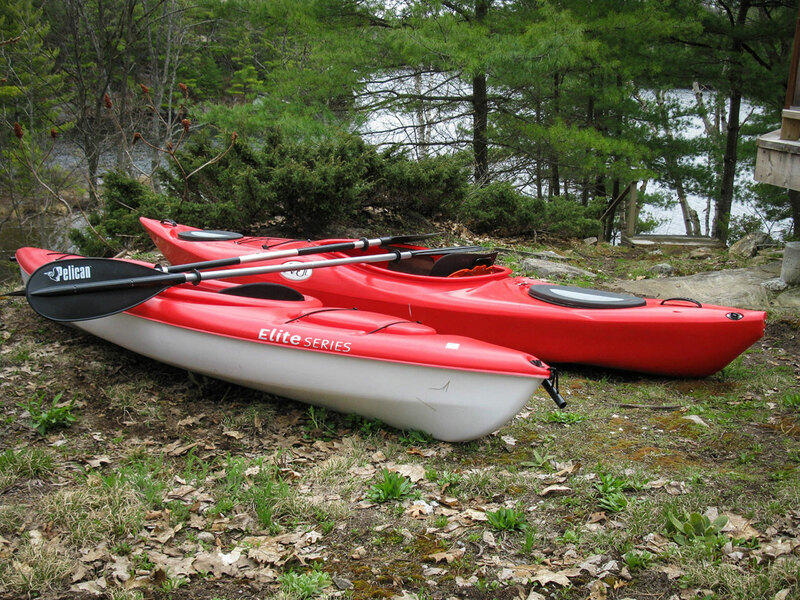 Recreational activities include fishing, swimming and waterslides, boating, canoeing, kayaking, paddle boating, tobogganing, as well as nearby skiing and skating. Whether it’s cold outside or you’re just snuggling with a loved one beside the fireplace, there’s plenty to do indoors. Click below to learn more. Go Home Lake is the home to a variety of bays, waterfalls, and a public beach, with a portage into Georgian Bay. With some bays being left natural without cottages, fishing conditions are excellent. 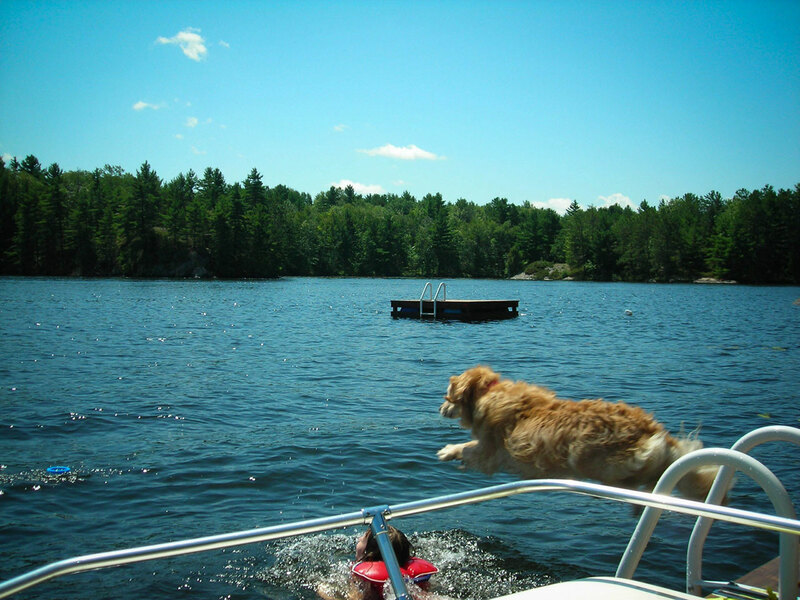 That said, fishing and swimming from the comfort of our own dock is among the best. 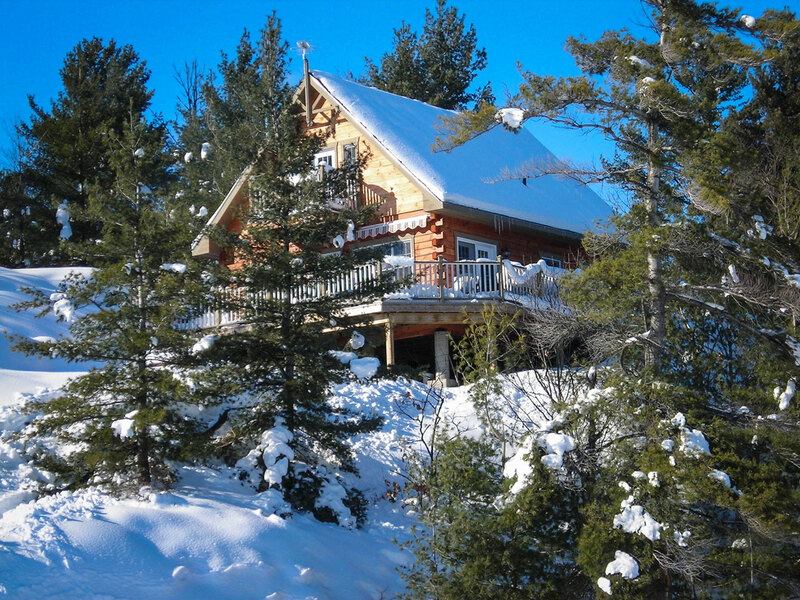 During the winter months, enjoy the idyllic setting along with nearby skiing, skating, and on site tobogganing. Click below to learn more. 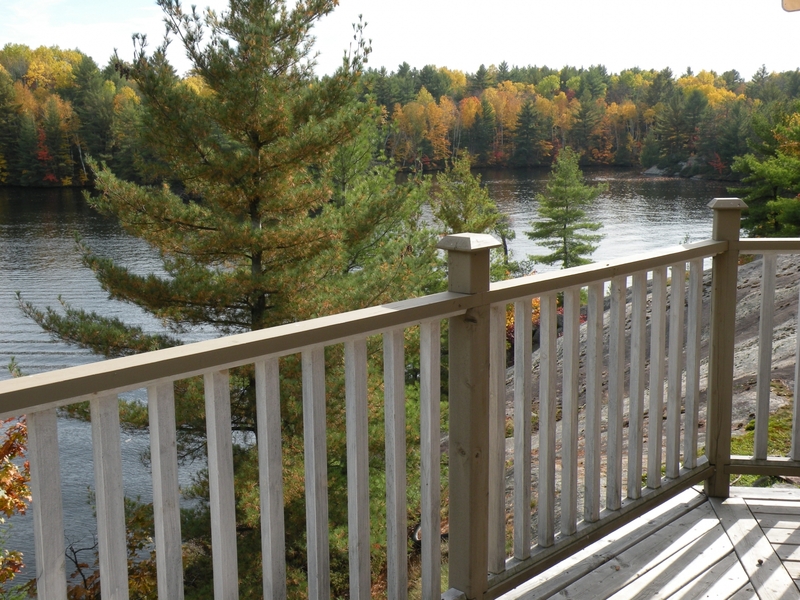 Introducing … Sandy Pines near beautiful Gravenhurst! 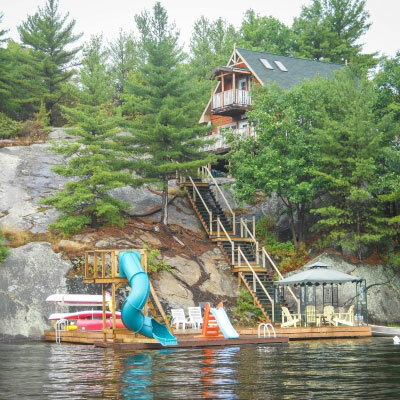 A cottage lover’s paradise located 5 KM from Gravenhurst on a protected bay area of Lake Muskoka. 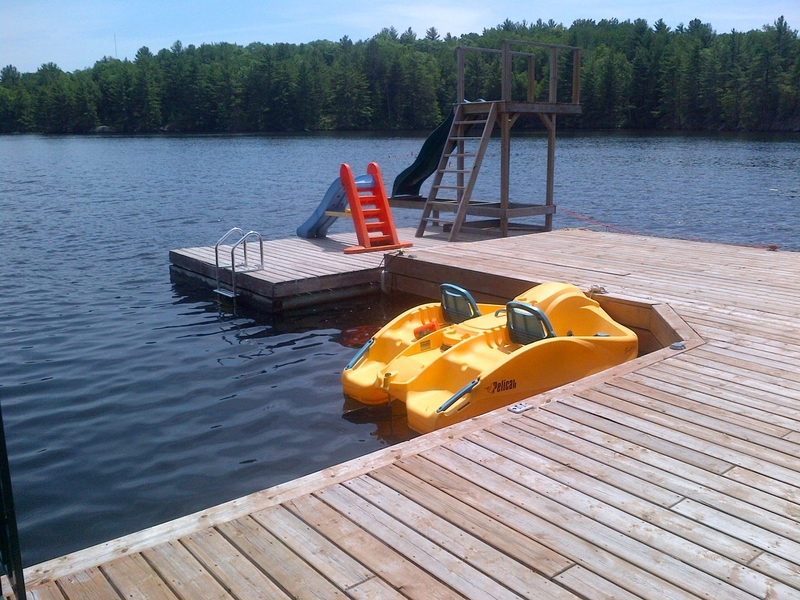 Ideal for swimming, boating, paddling and many other activities with sandy beach lakefront access. 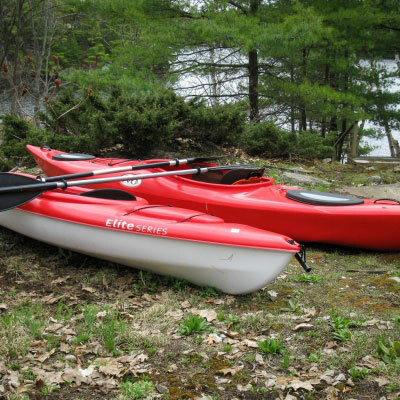 Canoe, kayak and accessories are provided along with horseshoes, croquet and volleyball equipment. 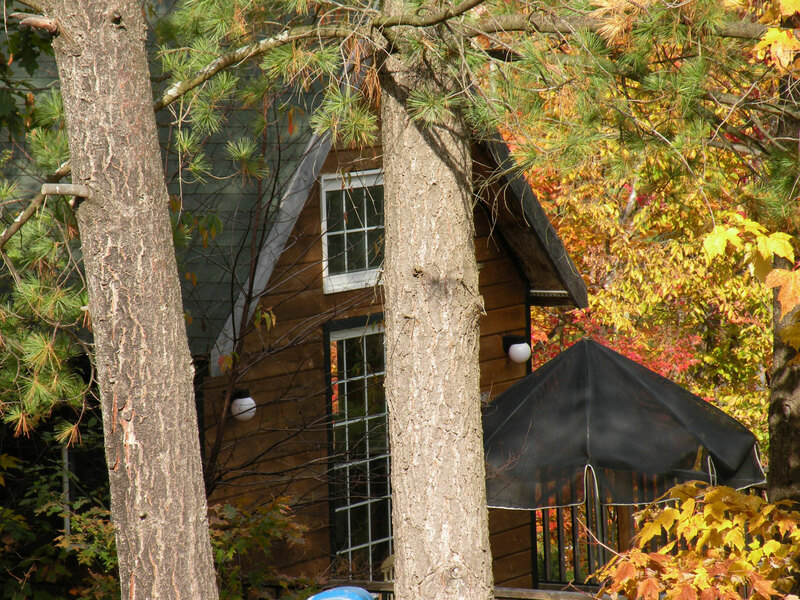 Sandy Pines offers a 1,500 sq ft, four bedroom cottage with two bathrooms (four-piece and a three-piece), screened in porch, large deck with a BBQ and an outdoor fire pit. 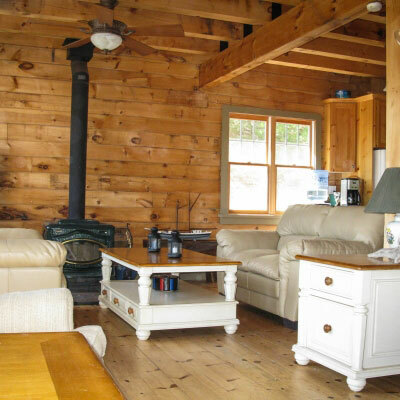 Enjoy modern conveniences that include a large screen TV with satellite and a DVD player while relaxing beside a warm fireplace. So much to do! Visit the neighbouring Taboo Resort across the bay for a round of golf, dining and entertainment. Nearby Gravenhurst offers endless things to see and do: sightseeing on the Segwun Steamship, shopping, Opera House dinner theatre, arts and music festivals, numerous restaurants and recreation trails. The Muskoka drive-in and Santa’s Village are also close by. Reservations for our new cottage will be integrated into the site’s booking system soon. In the meantime, please send us an email or give us a call: (905) 842-9841. We’d be happy to make your reservation! All other weeks Oct – May Please ask! Booking with us is quick and easy. First, find if your date(s) are available by using the booking calendar below. Then use the rate checker to get an estimate on how much it will cost. If you’re all set, just complete the reservation form and give us up to two business days to verify your details and provide you with a quote. That’s it! 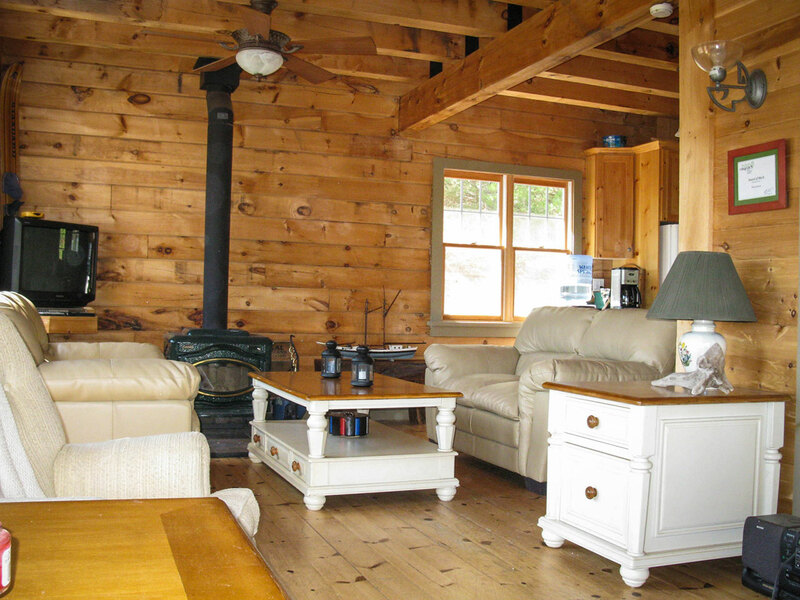 Note: Reservations for Sandy Pines are not yet available through our booking form. Please click here for more information on rates, contact us below to make a reservation. Pets? Linens? Cleaning? Boat Rental? Or feel free to drop us a line through the contact form below. 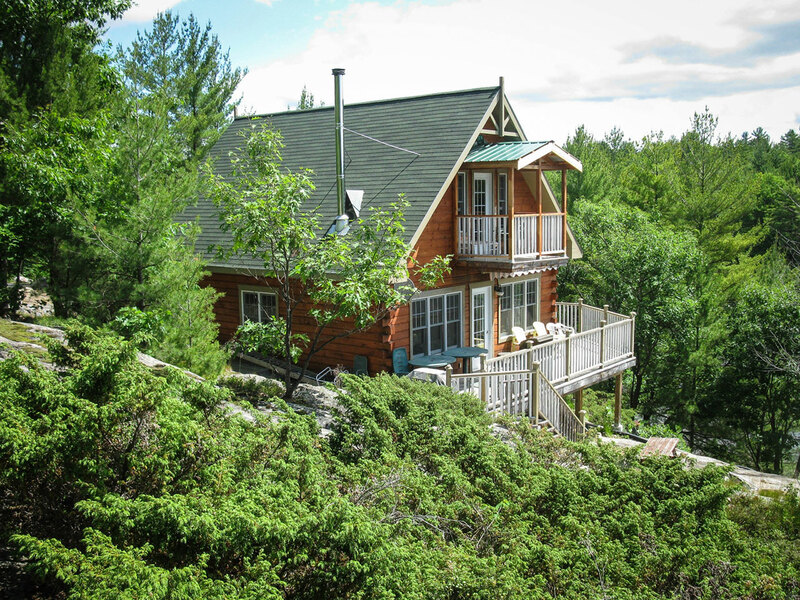 Which Cottage are you Inquiring About? Below you will find a collection of comments from our previous guests. 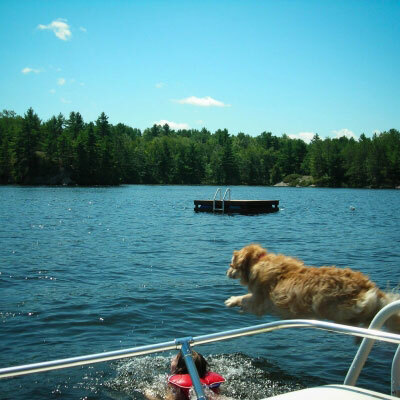 Like them, we hope you will find our cottage cozy and just the right type of getaway for you and your family. Have you stayed with us recently? Would you like to share your experience with others? Please fill out the feedback form below to submit your thoughts. If you would like to keep your experience private, you can always email us.